Vladimir Putin congratulated Iosif Kobzon on his 80th birthday. 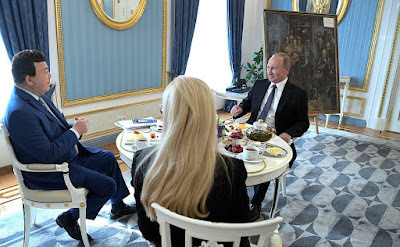 Russian President Vladimir Putin received in the Kremlin singer and public activist, First Deputy Chairman of the State Duma Committee on Culture Iosif Kobzon. Ninel Kobzon, the singer’s wife, attended the meeting too. The head of state congratulated Mr. Kobzon on his 80th birthday and presented him with a painting Miner’s Song by artist Alexander Zelensky. The meeting with the Kobzons was informal and took place over tea. President Putin signed an executive order awarding the merit badge For Benevolence to Iosif Kobzon for his active charitable and public activity. 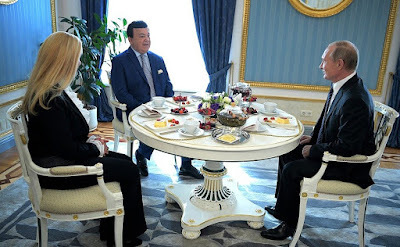 Vladimir Putin, Iosif Kobzon and Ninel Kobzon. 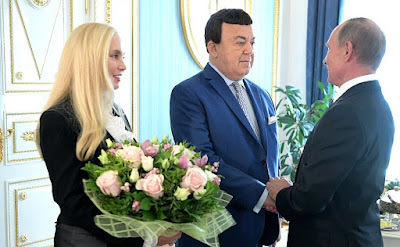 Vladimir Putin congratulated Iosif Kobzon on his 80th birthday. Left: Ninel Kobzon, the singer’s wife. President Putin congratulated Iosif Kobzon on his 80th birthday. 0 Comment to "Putin congratulated Iosif Kobzon on his birthday"